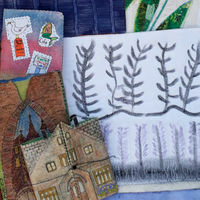 Diane is a local textile artist with a special interest in hand embroidered books and travel journals. Like most girls her age, she learned the basics of traditional sewing at home and in home economics classes in school, but it wasn't until she retired from her life's work in the medical field that she formally studied free motion machine embroidery through City and Guilds, and stitched textiles through Creative Stitch at the WI in Ipswich. She will be demonstrating how she searches for and assembles information, how she uses a sketchbook and will be discussing her experiences of taking part in Cambridge Open Studios.